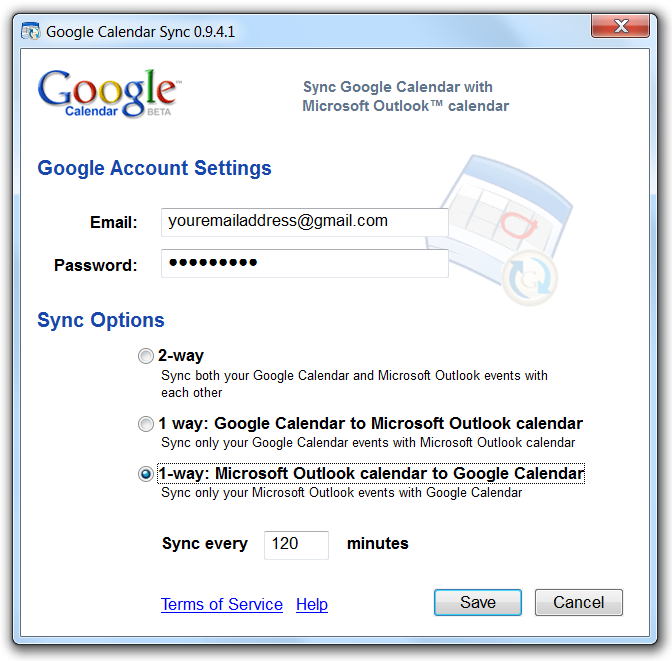 Despite the deprecated status of the Google Calendar Sync tool, the tool still works fine with Outlook 2013/2010/2007. I am no stranger to Android; I’ve been running it on my HP Touchpad since Winter 2011. Back them I played around with many features including the utility that could sync my Outlook calendar with my Google account. Since that Android tablet can show the Google account’s calendar, this sync meant that I could easily put all of my Outlook appointments on my Android phone. After the novelty wore off and my computer got replaced I forgot about this tool. I recently purchased a nice phone running Google Android (Motorola’s Moto X) and I got tired of adding my Google account to every meeting (as an attendee) just so that the event could appear on my phone. I remembered that I had once used a simple tool from Google which kept my Outlook calendar in sync with my Google/Android calendar. I tried searching for the utility and soon discovered that Google stopped supporting and distributing the tool in 2012. Google does offer a different utility called “Google Apps Sync for Microsoft Office (GASMO)”; however, you have to be a real paying Google Apps customer in order to use it. Also, many report that it messes up your Outlook profile. I learned both of these limitations the hard way: I installed it and was told that it wouldn’t work with my free Google account and simultaneously my Outlook profile got messed with. After investigating how I could possibly synchronize my Outlook calendar with the calendar on my Android phone I was shocked at the gaping functionality whole that I found. It seems that Google and Microsoft’s disdain for each other has resulted in Google pulling support for the old Google Calendar Sync tool. It seems that they do provide a tool for synchronizing Apple’s calendar with Google’s calendar, but support for Outlook is blatantly missing. Further research showed that a lot of people were still having luck with using the old Google Calendar Sync tool. I was afraid to download the copy that others were sharing, fearing someone might have embedded a virus or spyware in the installer, so I dug through my old backups and found the original file which I downloaded from Google directly many years ago. I installed it and it got straight to work with Outlook 2013. Now my calendar is completely in Sync. I let it sync about every 2 hours and only from Google to Outlook, but I am considering allowing Google calendar appointments to write themselves to Google. I highly recommend this tool to anyone wanting to get their Outlook appointments in their Google Calendar and/or on their Android Phone. You can continue to access all of your Google Calendar events at calendar.google.com or on your mobile devices. 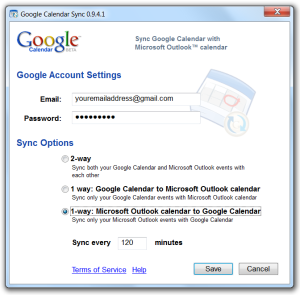 Follow these instructions to uninstall Google Calendar Sync from your computer. Thanks for that nice article. I’m trying hard to get my outlook acc synced with google and allthough it worked earlier it isn’t workign now. Which version of the sync plugin do you use? I am using version 0.9.4.1 right now, but I can tell you that I am also using a fresh installation of Windows 7. My PC was having many strange troubles before which led me to “repave” it. It was only after the reinstall of the OS that I decided that I should try to get my Outlook calendar sync’d with my Google calendar. I’m not saying that reinstalling one’s Operating System is a requirement, but just that this is the conditions under which I am functioning right now. I wish I knew of a suggestion that could help you. thx for replying so fast. Well I tried many things now i read about on other sites. I installed older versions of that plugin, I started Outlook as Admin and activated the plugin that way, I started the plugin in Win Vista compatibility mode, as one other guy mentioned it worked that way with him. I noted three error messages so far…..one of them is always showing up. Weird, cos directly afterwards my system was re-installed with a Win 7 system (half a year ago) the add-in worked fine as you described. So maybe a fresh system is a “hidden requirement” or something. Looks like i have to accept that Outlook calendar is not synced with my google one, which is unbelievable for me in a time, where everything is connected with anything. I have 4 calendar categories in Outlook. Does this Google tool sync categories also? Hi MarkJ, it doesn’t seem to me that my Google Calendar has any categories; it just has colors and they did not import from Outlook. I use color-code categories in Outlook and I did not see these at all in Google after the sync. James – I was afraid of that. Categories are important to me because I have over 400 contacts and many different “types” of appointments. If you search “outlook category sync to google”, you get a number of articles that point back to GASMO, which like you mention, only works on paid Google accounts. Then there is an article that shows some promise. Their solution appears to cost money though. Hi, I just bought a Lenovo Android phone and would like to download the contact from my Outlook. Do you have a software to do this? Lenovo doesnt provide any software. Hi, I read your post on Kefir, I have been interested in trying it and would like to know how to start. As for starting up Kefir home production I suggest you check out an article I wrote over here: . I think it is pretty easy, but I’ve been doing it since 2010. Please let me know if you have any specific questions.